The Pahrump Relay for Life fundraiser will see 30 teams and more than 430 participants Saturday, according to organizer Chanda Weiland. The 15th annual event kicks off at Petrack Park tomorrow at noon. Weiland said those who take part in the 12-hour relay help to generate thousands of dollars each year for both local and national cancer prevention efforts. The organization has already brought in tens of thousands of dollars that will go to the overall grand total for 2015. Nationally, the event is entering into its 30th year, while local events have been held for half that time. Relay for Life started in 1985 in Tacoma, Washington, Weiland said. Though some of the funds go to research efforts across the country, Weiland said local cancer survivors as well as their caregivers see the benefit of the funds raised. An additional benefit the event provides according to Weiland, is the convenience of not having to travel back and forth to Las Vegas for regular chemotherapy treatments local survivors must endure. She said when a person is going through chemotherapy treatment they tend to get tired and exhausted to the point where driving themselves to and from the hospital is not a wise option. Weiland also said she too took care of a family member diagnosed with the disease and is all too familiar with the experience. Weiland said participants and visitors can expect to see various activities and entertainment throughout the day. A regular part of the event is the reading of the names of survivors by KNYE radio station owner Karen Jackson and local resident Rodney Camacho. A schedule of events can be located on the Pahrump Relay for Life Facebook page. 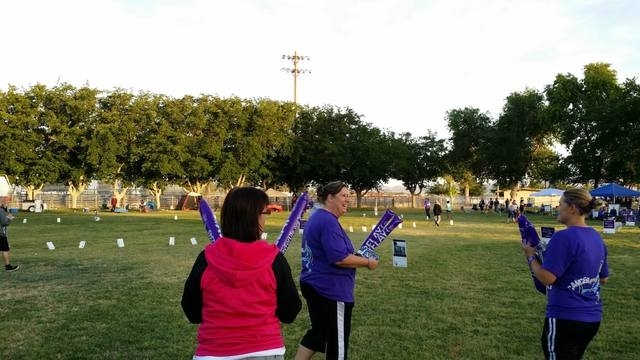 For additional information on the Pahrump Relay for Life and survivor services, contact Shannon Moore at 702-891-9022 or email shannon.moore@cancer.org. The American Cancer Society can also provide information on local services at 1-800-227-2345. The history of the Relay for Life event goes back 1985 when Dr. Gordon Klatt, a colorectal surgeon decided to raise money for the American Cancer Society out of his joy for running marathons Weiland said. Klatt walked around the track at the University of Puget Sound in Tacoma, Washington for 24 hours. During that time, friends paid $25 to run or walk 30 minutes with him. He walked roughly 83 miles and raised $27,000 for cancer research. At present, roughly four million people take part in Relay events in over 5,000 communities in the United States.